Originally written for the Doha Film Institute website. The holy month of Ramadan encourages a social phenomenon that seems to increase over the years: Al Mosalsalat or TV series. During the 70s and 80s, post- iftar entertainment was a fun fazoora or riddle to be answered at the end of the 30 episodes. Remember fawazir Sherihan and Nelly. The timing was also perfect to secure viewership; after breaking the fast everyone is home gathered around the television with only a few zapping choices. With more Arab stations came more entertainment options, and cable networks are currently competing to showcase their programme for the holy month. There are even stations dedicated to soap operas; in case you’ve missed an episode or want a re-run of your favorite series, you can always catch up. This year, the choice has widened for more than 50 Arabic series. 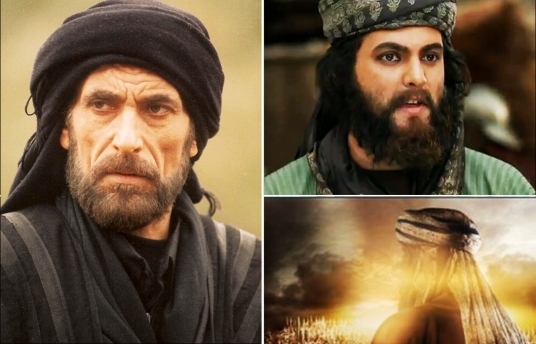 Ramadan is now a platform to share themes such as the historical Omar ibn Al Khattab or political “Sister Therese”, an Egyptian drama about Egyptian twins of different religions. Comedy, of course, is highly popular and a necessary component in Ramadan series. Qatari actor, director and writer Saad Burshaid adds “How many TV series one is able to follow? A maximum of two and everybody counts on re-runs all through the year to catch up with what they missed during Ramadan. It’s true we have a larger variety, but the content is repetitive, and many are very similar. They simply lack originality. But producers still prefer Ramadan because it has proven for the last 20 years, that this time of year gathers the highest percentage of viewership, which means more advertisement and consequently more profit”. Burshaid, a TV series actor, likes to watch new productions. His picks for this year are “Omar Ibn Al Khattab” and “The Band of Naji Atallah” starring Egyptian superstar Adel Imam, the story of a retired police officer at Tel Aviv’s Egyptian Embassy who is exposed to problems because of his objection to Israeli brutality against Palestinians. From Kuwait, Burshaid recommends “The Night Watcher”, a drama set during the Iraq-Kuwait war in 1990. This year YouTube decided to play a major part in one of Ramadan’s most popular traditions and created a channel for it. Now people can also choose the times of their favorite show in high quality through YouTube’s Ramadan channel. Before 1995 there was only one leader, said Burshaid. “The Egyptians. But afterwards, there was more awareness into shifting to the private sector and we can say now that Egypt, Syria and the GCC are competing with each other. Turkish soaps are pretty popular, but only because they’re dubbed in Syrian. They look like people from the Levant, share a similar culture, nature and even food – which people from the GCC are well acquainted with. My grandmother thinks they’re actually Syrian and not Turkish”. With so much choice across a large number of channels, the debate about whether these shows are a distraction for worshippers during the holy month rages on. “We need to take a break from time to time when we’ve been fasting all day,” Burshaid said. “Then again, people have a choice of not watching if it offends them. That’s what the remote control is here for. They have loads of alternative choices and they can simply disregard them”.